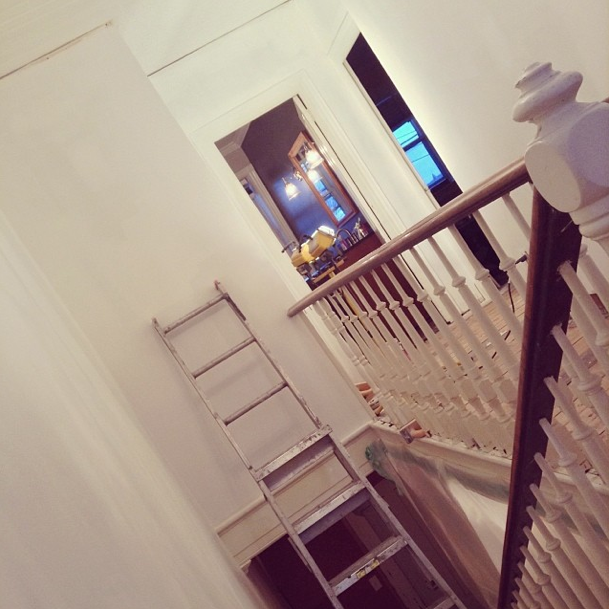 Heritage Row Reno | The reimagining of a century-old row house in old St. John's. 1. Progress! 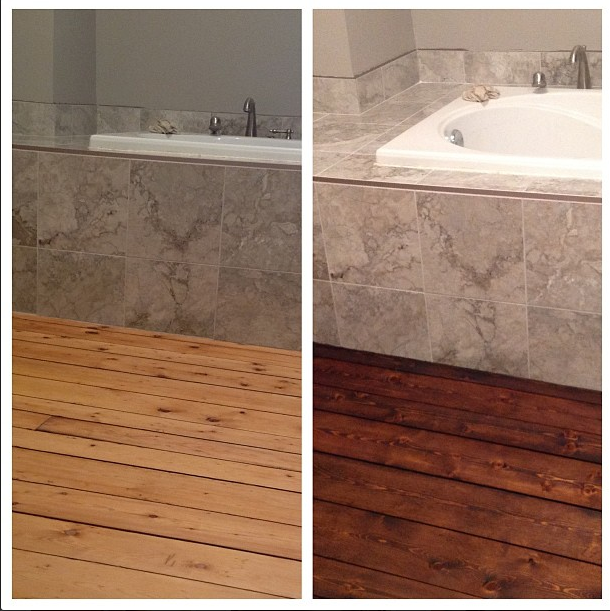 We sanded, repaired and stained the master bath floors. 2. Progress! 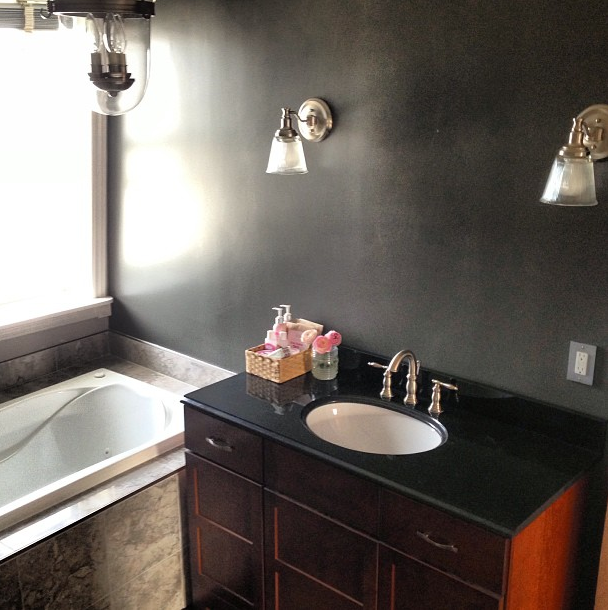 Painted walls, light fixtures installed; a finished bathroom, minus a mirror that was added this summer. 3. I was given the go-ahead to resume gym workouts last spring, for the first time since being diagnosed with lupus 4 years ago. 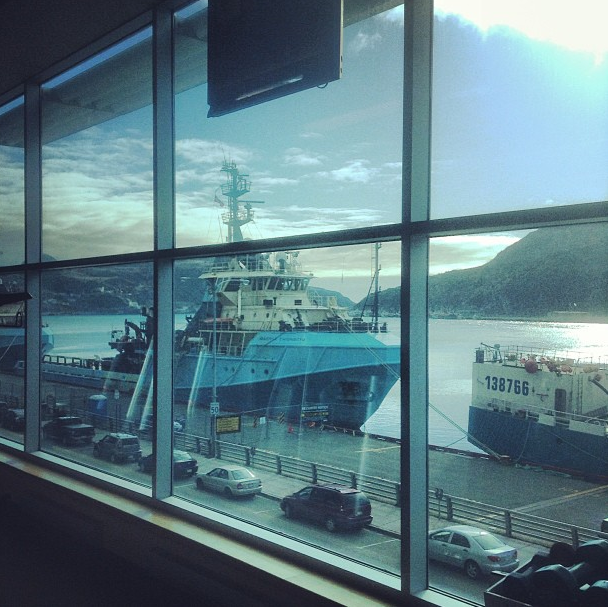 I am so grateful to be capable of exercising without severe limitations, AND that this is my view at the gym. 4. 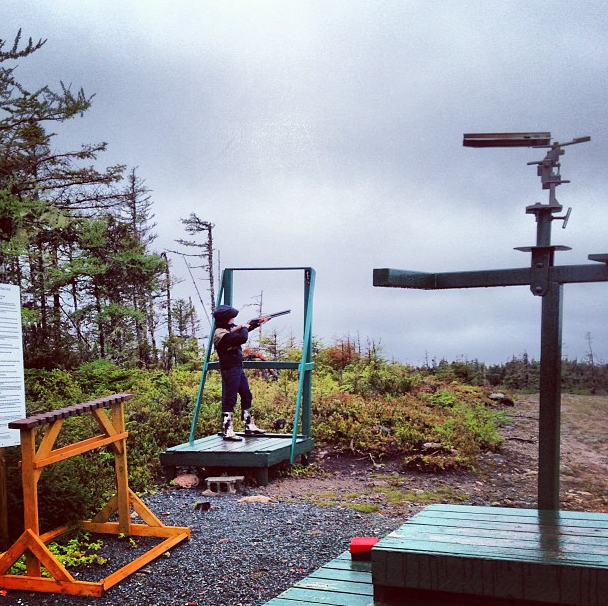 We joined the local Rod and Gun club, and had fun shooting skeets and targets over a few weekends this spring and fall. We’re looking forward to our Hunter Ed course coming up later this month. 5. 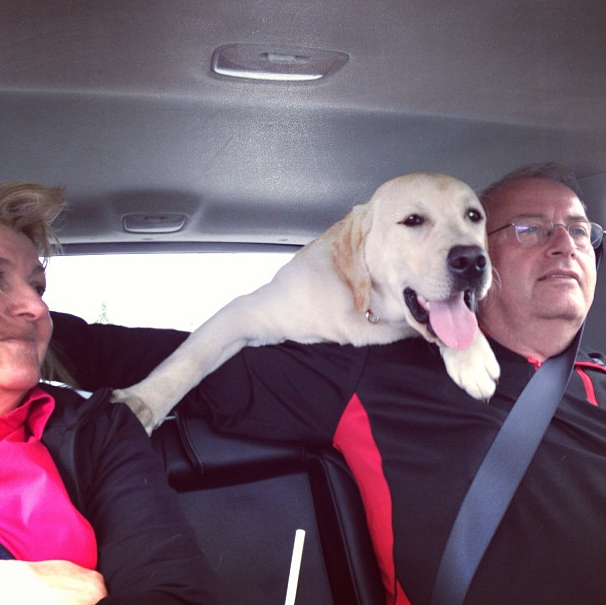 My parents visited! 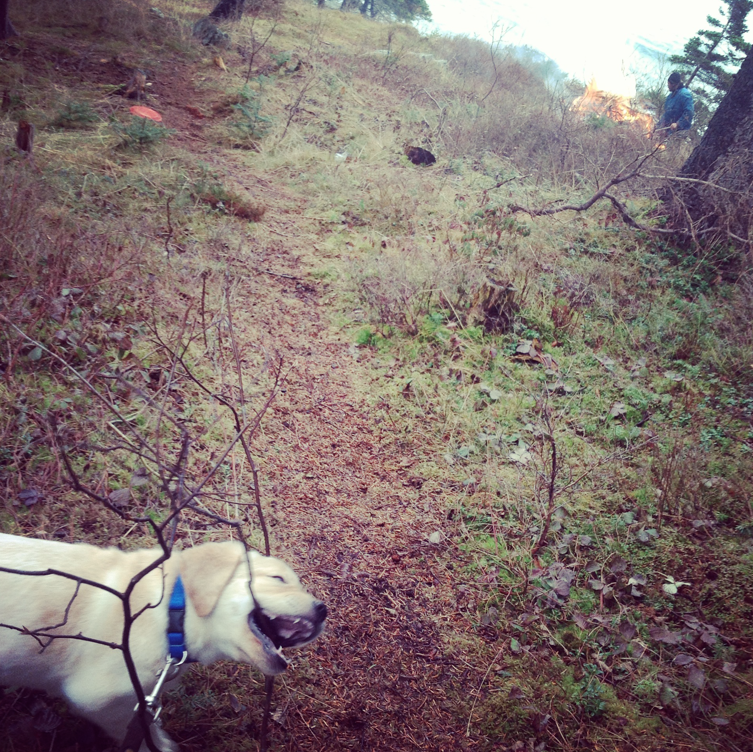 Fergus loved meeting them, climbing on them, jumping on them, etc. etc. 6. 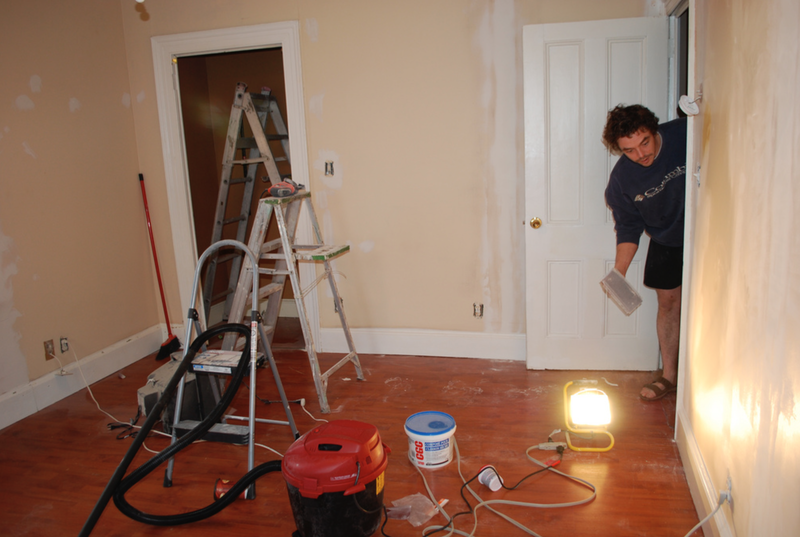 We spent most weekends at the cabin this summer, which meant that no renovations were made at the house. No regrets!! 7. We also spent a couple spring and summer weekends at dog shows. Fergus received his Canadian Championship title on the day he turned 10 months! He *IS* pretty cute. 8. My longest/oldest (she is neither tallest nor eldest of my friends) /best friend since we were 3 visited me in St. John’s for a whole WEEK this summer! We had an incredible time, and I hope we can do it every year. 9. Back to school! More accurately, STILL in school. I am in a new program, and love being back in the classroom, even if it IS every day of the week. 10. 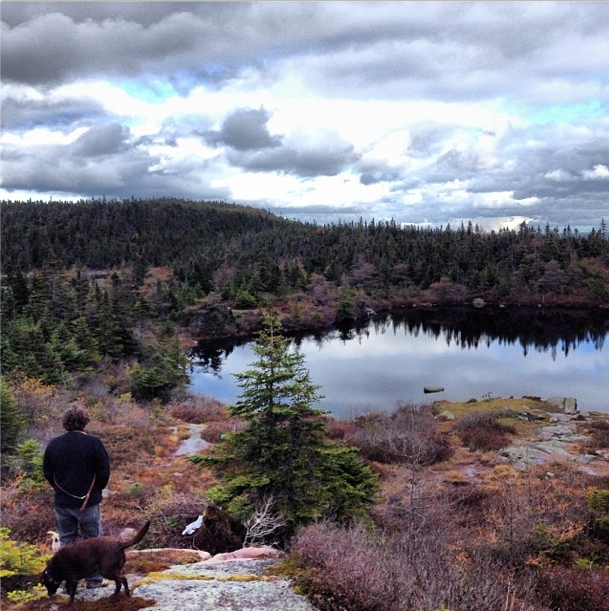 A beautiful fall, with too many hikes to count. 11. Progress! 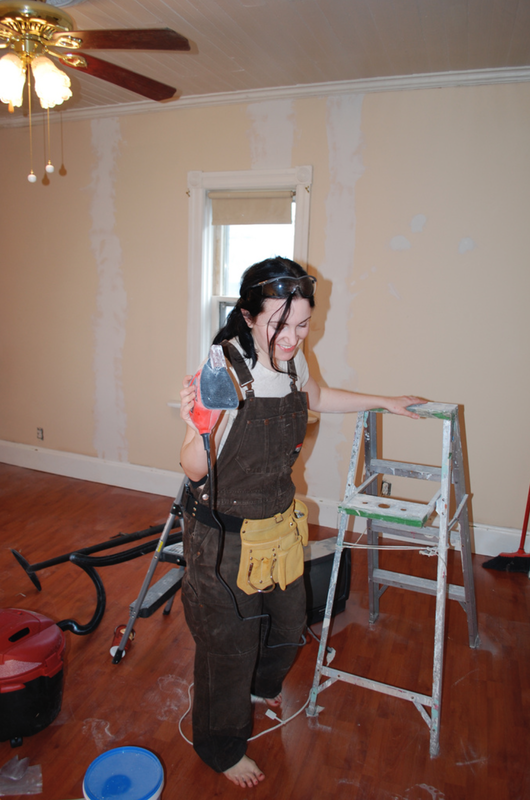 We sanded the third floor hallways, primed and painted, and stripped the laminate to expose the original pine floors. Watch the blog for updates on this space. 12. Christmas! Last year we didn’t have a tree for the first time, because we were expecting Fergus on Boxing Day (when we escaped to the cabin for a couple weeks). 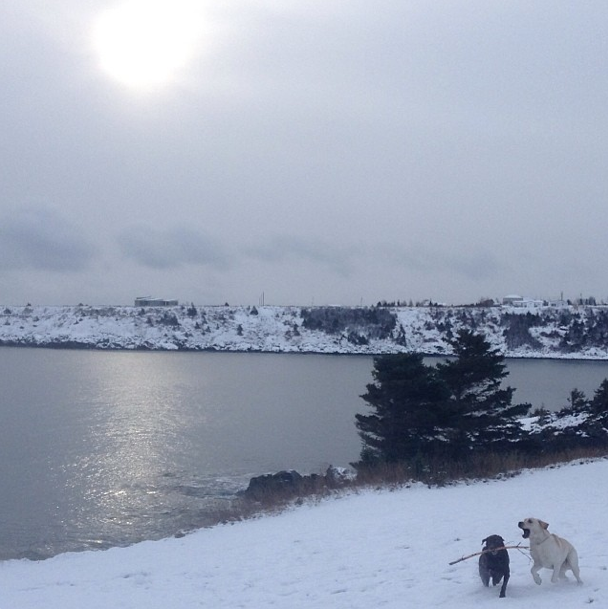 We took it down on Old Christmas Day- a Newfoundland tradition. 13. We celebrated New Years Eve at the cabin for a 6th year in a row. This time last year, Fergus was a tiny, new inclusion, and Penny wasn’t sure if she liked him. Flash forward one year, and they are best friends. We’ve been busy over the last few months with a new addition to our family: FERGUS! 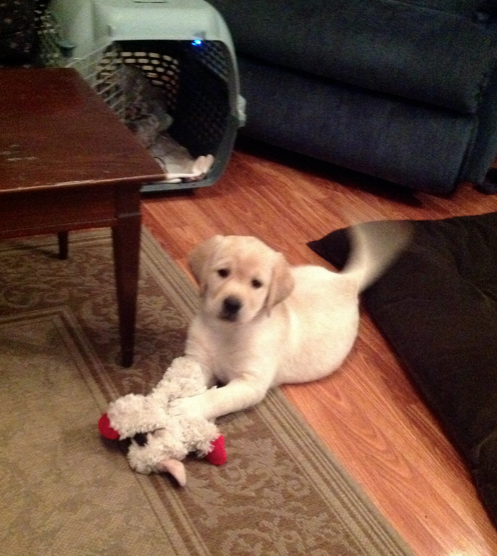 Our first photo of Fergus at home, right before we dashed off to the cottage. Fergus Mór (Fergus the Great in Gaelic) is a yellow Labrador Retriever puppy who’s brought a lot of love and excitement to our household. 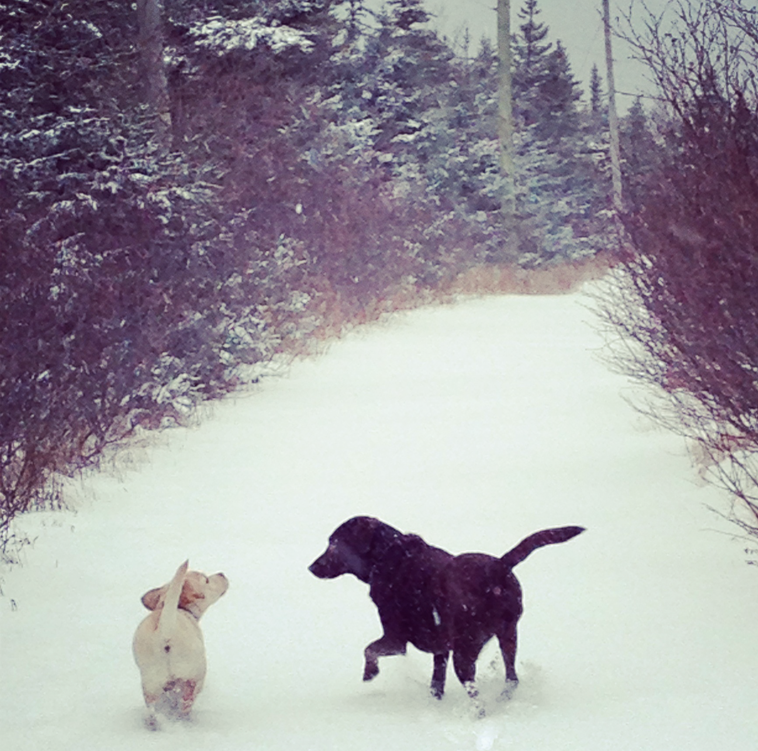 Our three year old chocolate Lab, Penny, has adjusted to his arrival better than we could have hoped, and they have lots of fun together, all day long. 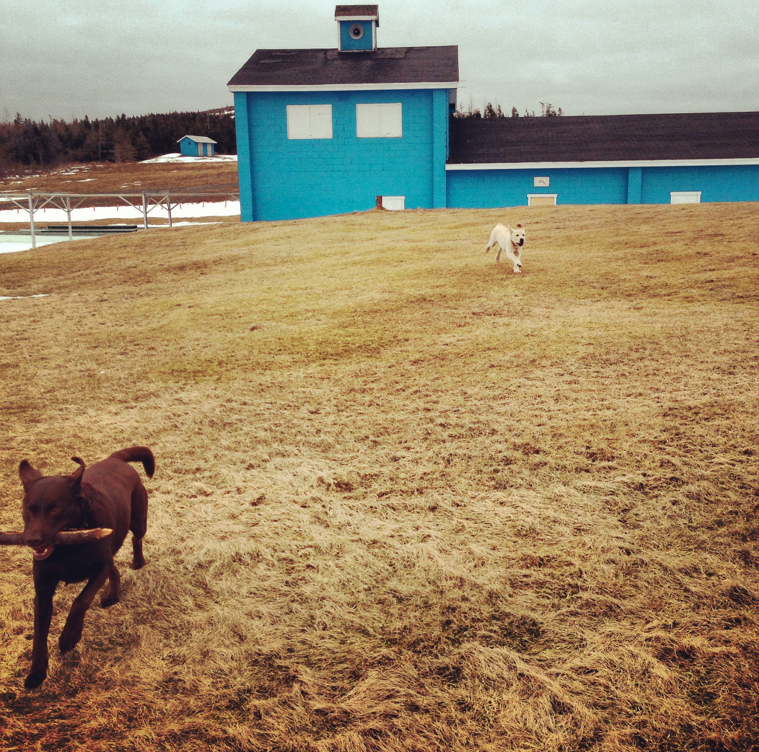 Retrieving sticks at the Harbour Grace boathouse. 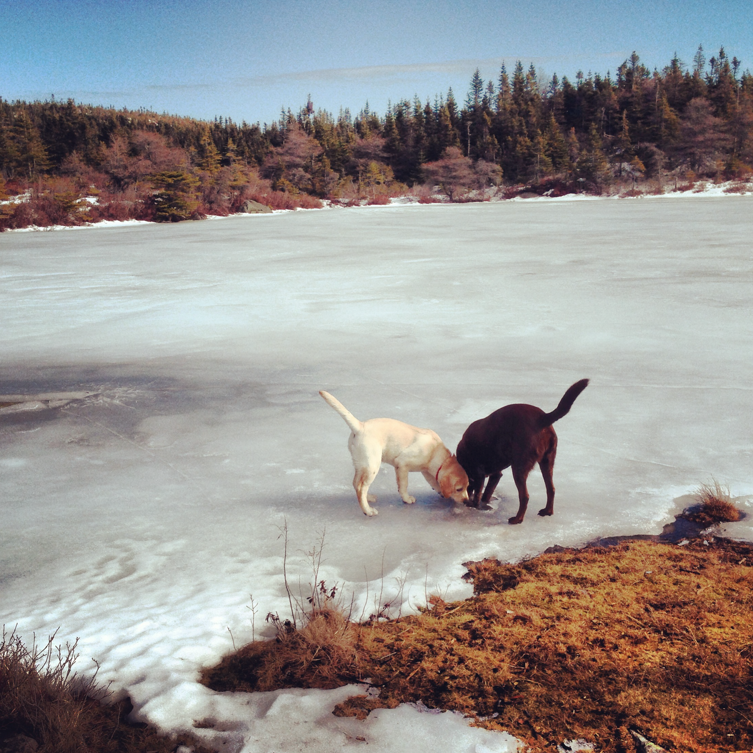 One of the reasons we love Labradors is our connection to the breed’s heritage, which began right here on the island of Newfoundland! The St. John’s water dog was recognized by the late 1700s as a breed comprised of many varied dogs brought here by early settlers. 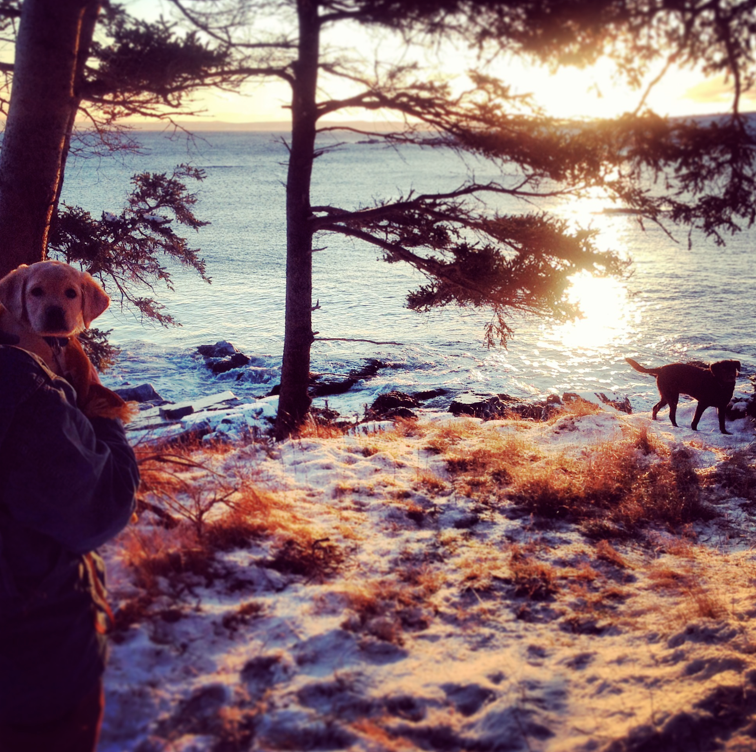 Fishermen recognized their usefulness in their trade: the dogs were expert swimmers, easily pulling nets to shore, and could help in many other shoreline tasks. The breed became so popular in the early 1800s that the leading Newfoundland merchants brought several dogs back to Poole, England (where J’s family originated!) The lineage continued its development in England, where an aptitude for retrieving waterfowl was developed in the breed. 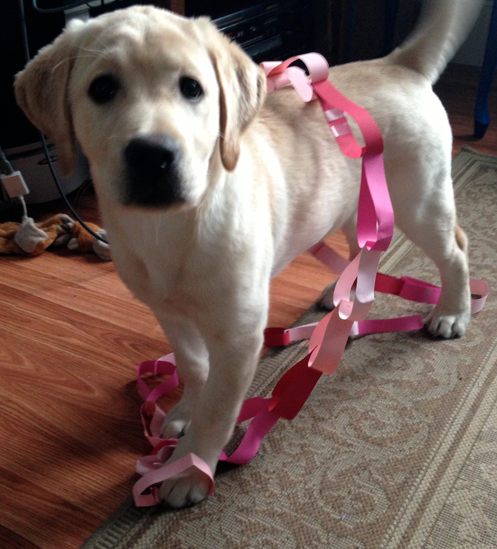 The Labrador Retriever is now the most registered breed in North America, and for great reasons; the breed has an exceedingly friendly temperament, they are eager participants in training, and these dogs thrive on attention and activity. They are low-maintenance in terms of grooming (although saved grooming time will be spent vacuuming their fur off everything you own). 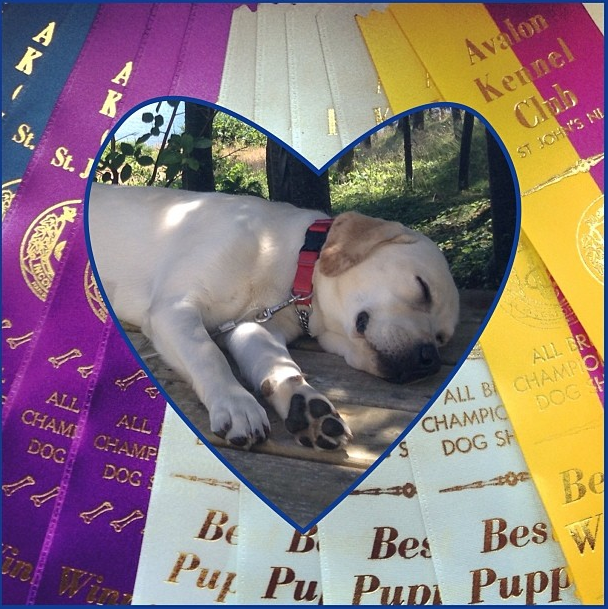 Fergus’ breeders asked if he could participate in local conformation competitions, and we’ve agreed. He competed in Baby Puppy Class at the Newfoundland Kennel Club All-Breed show last month, and won breed category (uncontested, hah). Between that time and now, we have been doing important framing, plumbing, and electrical work on the space, albeit at a very comfortable pace. A pretty sizable kitchen upheaval took place last summer, which stymied our steam. 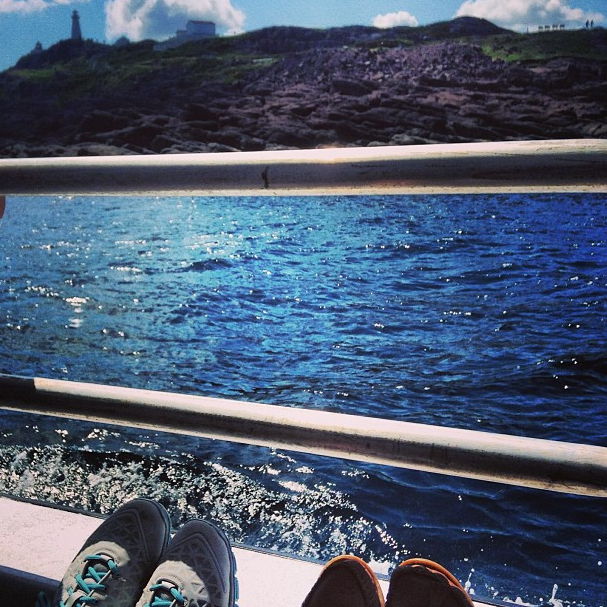 Then this year, we had the nicest summer on record. But no more excuses: we have the plumbing and electric installed, vanity purchased, and we’re pretty much in the home stretch of this make-over! 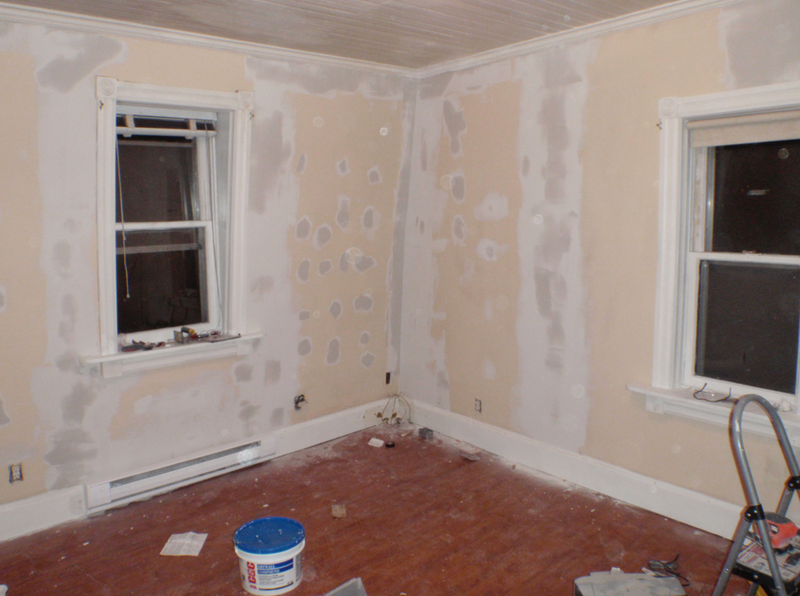 See Kent Dates for more details on how we gutted this room to prepare for the master bath. 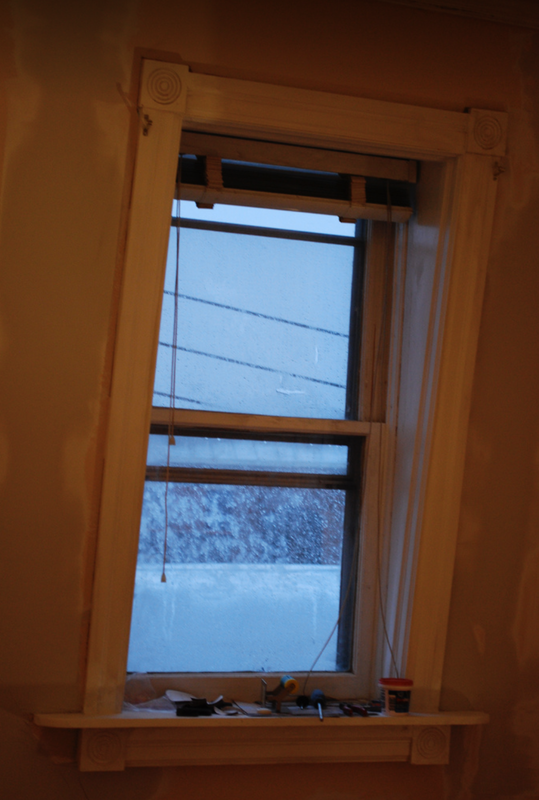 March 2012: the frame is built, and tub laid in for visualizing tile and fixture placement. Also, new toilet placed, ready for plumbing! The bulkhead and ancient cast iron sewer vent were removed. Next, we waterproofed the plywood surround and backsplash with Mapelastic™ AquaDefense. We laid down our favourite tiles to choose the parts of each that we wanted to feature. Filing the edges of marble tiles after they’ve been cut. This process was only done for the corner edges that will be exposed. Mortaring the cut tiles into place. We chose brushed nickel tile edging to frame the tile. The tiles were set in the polymer-modified mortar for 48 hours, with ‘tombstones’ placed to prepare for the grout lines. After the grout came plumbing, and installing our fixtures. We chose the Aqueous Roman Tub J-Spout series in brushed nickel. Cribbing to support the bathtub. Mortar, covered with 6 mil vapour barrier, and then placing the tub! Yep. I totally took a bath when it was first installed, before the corner bulkhead walls were restored. 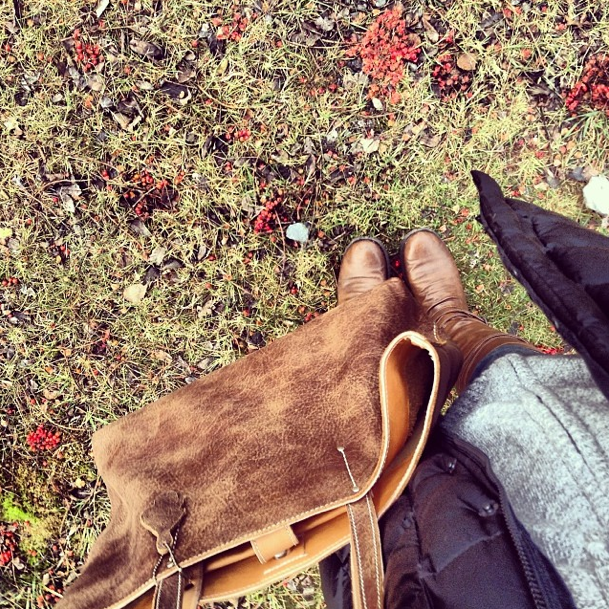 November 2012: Progress to date! New vanity is placed, but not plumbed in yet. 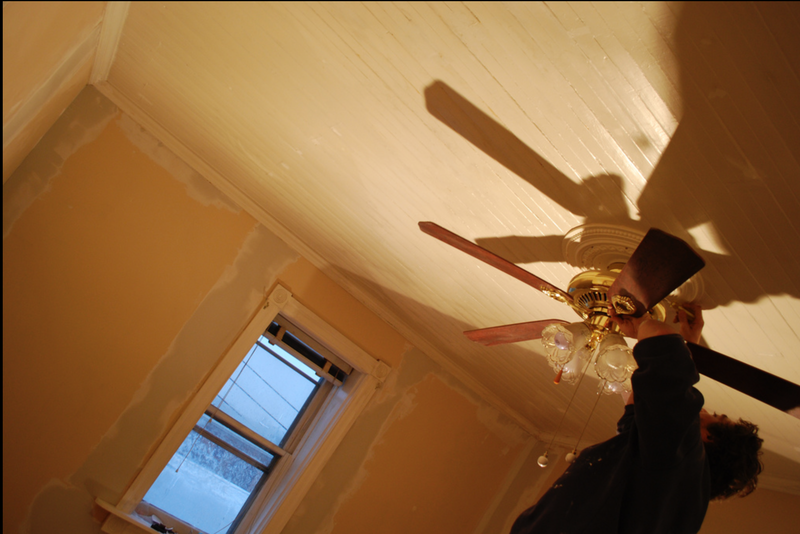 Crown moulding (not original) being removed. The McAlpine Directories were a series of registries that listed civic and business addresses of individuals residing in the Atlantic provinces (referred to as the maritime provinces in the inaugural directory). 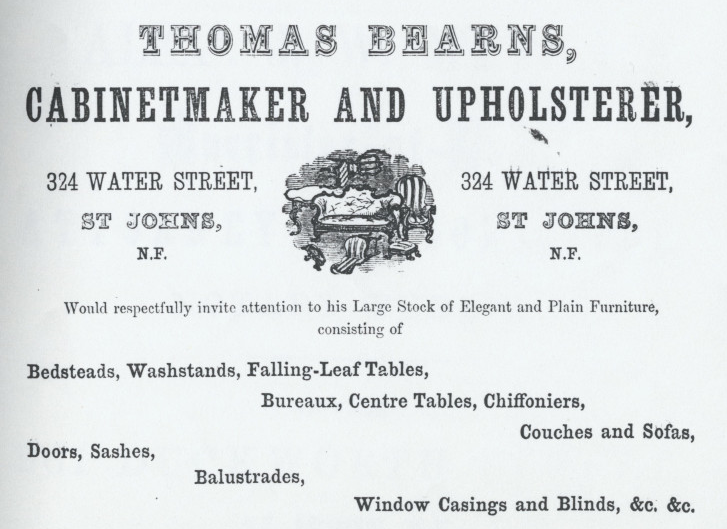 Widely available to residents of St. John’s, the directories were commonly used to locate particular business or household provisions, to send correspondence, and for many other purposes. 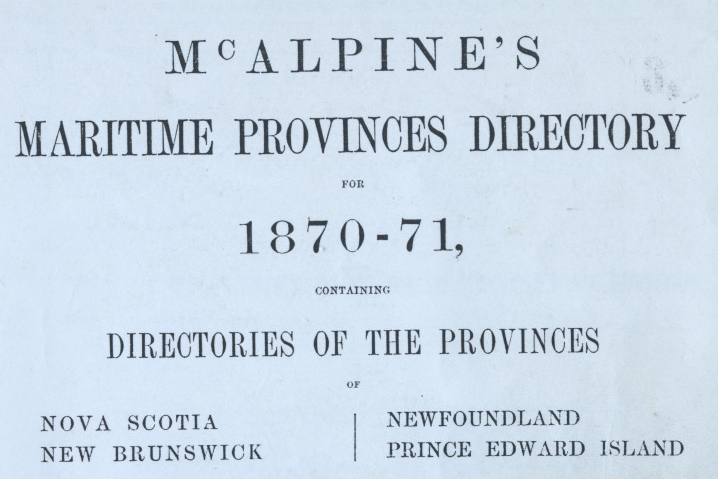 The first McAlpine Directory was issued in 1870-71, published by David McAlpine of Halifax; The Center for Newfoundland Studies at MUN has the document available to view in its entirety here. 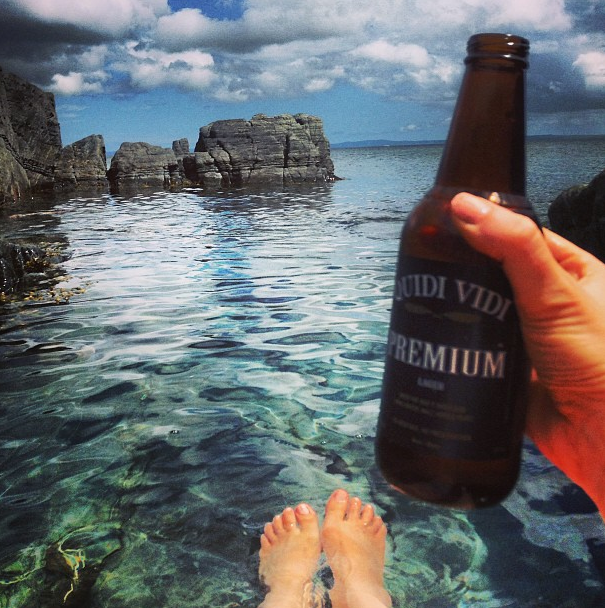 The sections specific to Newfoundland are here. For a note on the earlier Hutchinson’s Newfoundland Directory for 1864-65, see bottom of page. The documents are searchable, so it’s easy to locate particular streets or surnames (‘search this object’ in menu at left). This allows access to a wealth of data; not just who lived in our home through the last 15 decades, but also can provide information on past socioeconomic profiles of particular streets and neighbourhoods. Of course, this information wouldn’t be useful without knowledge of streets and neighbourhoods that existed at the time; Newfoundland GenWeb has a list of former street or property names, and their current counterparts. The list was generated through information outlined in Paul O’Neill’s book, The Oldest City The Story of St. John’s Newfoundland. This is further evidence that our house is likely an older construction than we initially thought! Our street was dominated by fisherman and labourers, but also several carpenters and shoemakers. Note the many families living together, often sharing the same line of work. The 1894-97 Directory for Newfoundland can be found here. This guide is especially useful because the Great Fire of 1892 displaced many residents and businesses; this volume reflects some of the changed locations. Our street was largely spared in the Great Fire, partially evidenced through the unchanging civic addresses from the 1870 volume to this volume. Also, there are notes about afflicted businesses moving to our street directly after the fire. 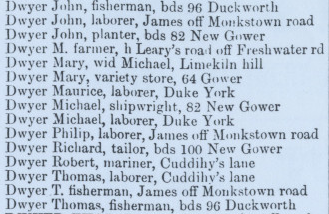 The 1894-97 Directory lists a new occupant of our house: John Grace, a labourer. Oooh! Pretty cool: in 1904, John Grace was still living in our house: he had upgraded from his 1885 occupation as city time keeper, to storekeeper for City Works. 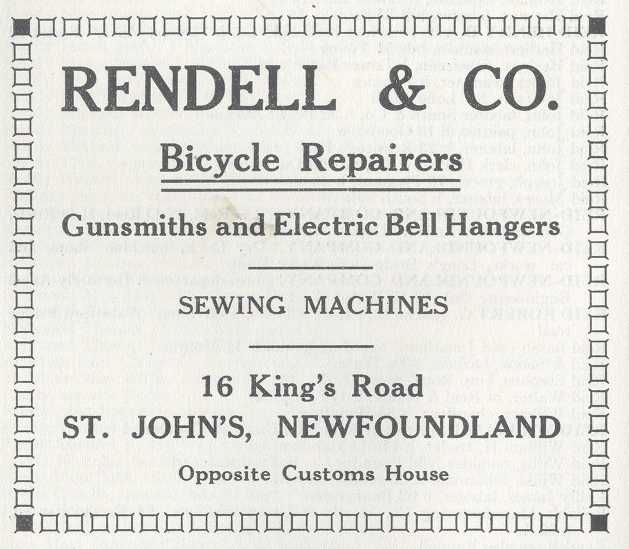 The 1908-09 Directory for Newfoundland can be found here. It seems that Mr. John Grace is still the occupant of our house, but he’s now a Sanitary Department watchman! 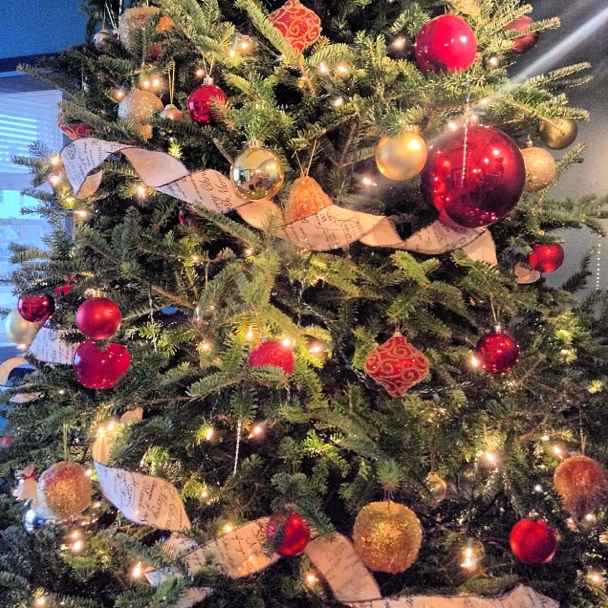 If the McAlpine Directories help you to flesh out the story of your house, leave a comment! *The earlier Hutchinson’s Newfoundland Directory for 1864-65 is available here. This directory is much more business oriented than the later McAlpine Directories, and far fewer individuals are counted in its survey. Nevertheless, it is a good resource for historic research.